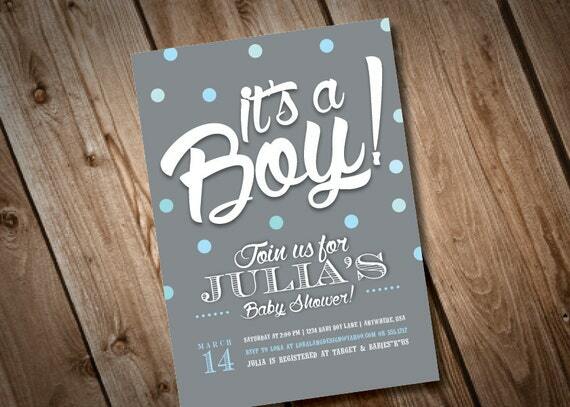 Create the perfect baby shower with this trendy, fun baby shower Invitation. Celebrate mommy-to-be and baby boy with this fabulous DIY invite! Once purchased, this trendy invitation can be customized with your provided information. I than e-mail the purchased file to you so that you can choose to have them printed any way you'd like! This listing is for a high resolution digital file of the It's a Boy Baby Shower Invitation in JPEG or PDF format (300 dpi). I will then email you a digital proof for your review. Once approved, I will email you the hi-res file. These invites can be printed at any photo printing place such as Target, Walmart, Walgreens, photo printing web sites, your home photo printer, online printer, copy shop, etc. Default invitation size is 5x7. You can also request this to be a 4x6 size. Buyer is welcome to print invitation as many times as they like. Any file sharing or reselling of the file or artwork contained in the file is strictly prohibited.